I attended Westmont College and was contacted by the editor of their magazine because they wanted to write and a short article about my passion for handwritten letters. At the time after talking to some friends I thought about starting a local letter bundle project and so I purchased the domain, letterbundles.com. After a few months and mentioning it in the interview, I gave it a lot of thought and decided to not reinvent the wheel, even though I was thinking of writing letters locally in Southern California where I live. Again, after much thought, I would rather people support other great organizations that are already established and that I have personally supported. So, if you read the Westmont article and especially liked the last paragraph, click here to write letters for The World Needs More Love Letters. 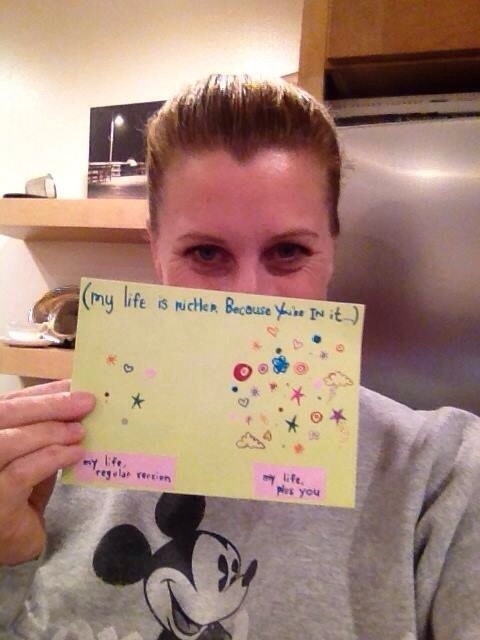 Girls Love Mail is an organization that writes to newly diagnosed cancer patients. Letters of Love was started by a teenage boy! It’s a great way to write to seniors who may be in need of a friendly letter. And, here is one of my favorite organizations, where they list a few more letter writing sites. Lastly, if you are in need of high-quality stationery you can support me and click here 🙂 It will help my stamp fund for when I speak to classes and leave them with stationery and a stamp! At a recent school presentation about why handwritten letters are still important! A 5th-grade student writing a letter to a relative after hearing my talk. 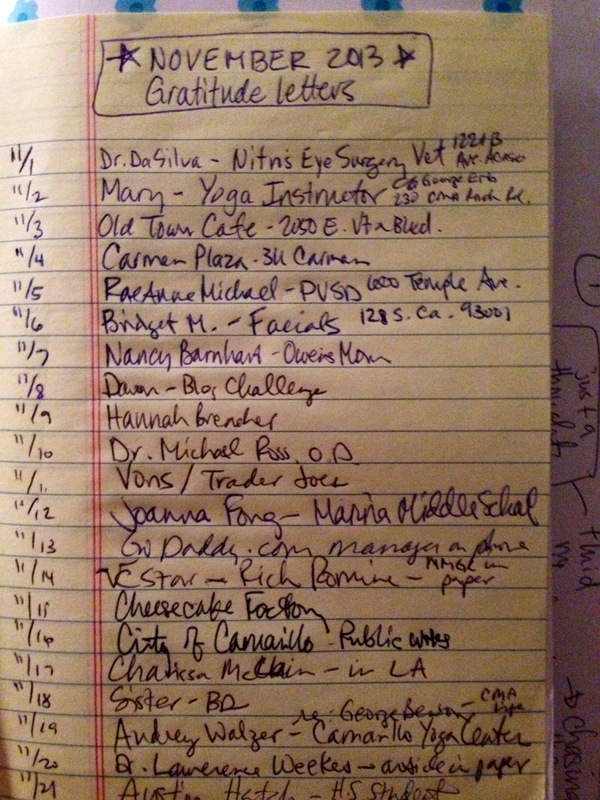 Thank you all who have watched my TEDxCamarillo talk about the gift and power of handwritten letters! It has been fun getting letters, reading comments about how the talk inspired people to write and hearing stories about how it triggered memories about special letters from you! National Letter Writing Month is right around the corner. I’ll write more about that next time! I’ve decided to just have an Instagram account for all things letter writing for now. When my book is ready I’ll definitely be back on this site as the name of the book is … A letter a week. So, if you are reading this please jump over to Instagram and follow me at @aletteraweek. April 1 started the #write_on 30 letters in 30 days challenge so I encourage you to dive in–even if it’s only a letter or two. Writeoncampaign.com is full of ideas on who you can write to over the month. Happy National Letter Writing Month and I’ll see you over on Instagram. I don’t know about you, but I am so tired of reading 10 steps for this, Seven sure ways to do that. There are so many tips out there on how to write the correct blog post to and ways to get more readership. I am writing this blog solely as an outlet of my passion of letter writing. As you can tell (if you scroll back, I guess), I haven’t written in a few months. I’ve written lots of letters and taken a few photos for blog posts. I’m living life and the days keep going by. The reason for this post is to just say I don’t think you need a reason or a how to write a letter. When you feel compelled to write, just do it. Yes, you’ll need to put some effort into what to say and buy some stamps and know where the nearest post office or mailbox is, but I guess that’s where the time and thoughtfulness comes in. My card choice may not be perfect or my writing sloppy, but my intention ALWAYS behind writing is to sit and connect with that person for a moment–even if they don’t reply. Above is a sample of some of the stationery I received from girlfriends this month for my birthday. It’s a such a great gift for me and I love thinking of my friends when I send notes to others. 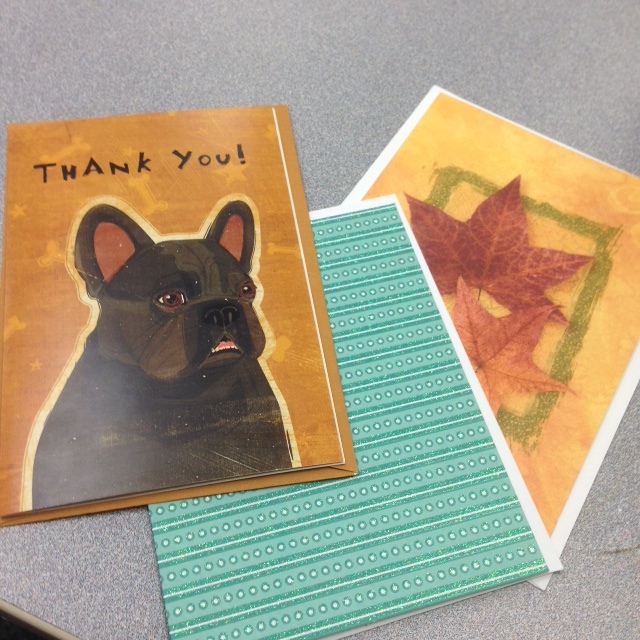 I have a French Bulldog that looks just like this card so I was thrilled to receive these. It’s also nice to get stationery that you have never seen before. That’s where specialty card stores are a must for me, especially when we travel. The fall leaves is blank inside and was perfect for this time of year and green is my favorite color so of course I loved these too. This photo is from a note from my dad that I have had for at least 10 years. We always talk about what book we are reading or the latest movies we’ve seen on the phone. His commute to work is about an hour and at the time mine was almost that long. He sent me a box (aging myself here) of The World’s 100 Greatest Books on tape. That would be cassette tape. For some of you that was something from the 80’s and 90’s. The link is for the CD’s, but I highly recommend listening to these. Each tape (CD) is 45 minutes long and is basically a “Cliff Note” style narrative. Back to the note … I kept it because as soon as I opened the box this small note was on top. Seven words that when read put a smile on my face. Seven words that weren’t complex or anything new. Seven words that were written as a short communication, but that had a big impact on me. A simple piece of paper, but written words from the man is means the world to me, my dad. A note is defined as a “short informal letter”. I like to think of them as short letters. My dad has written me other letters (which I have also thrown away some, blog for another time) but this one has stayed with me for some reason. That’s what I enjoy about handwritten correspondences–You never know what one writes that will awaken you. Will it make you smile or tear up? Will the words be no big deal and it gets thrown away immediately (which this very easily could have). Will the words remind you of a certain time (this did—commuting for a job and the passion for reading that my dad and I share (he’s a reading instructor so I guess I didn’t have a choice)? 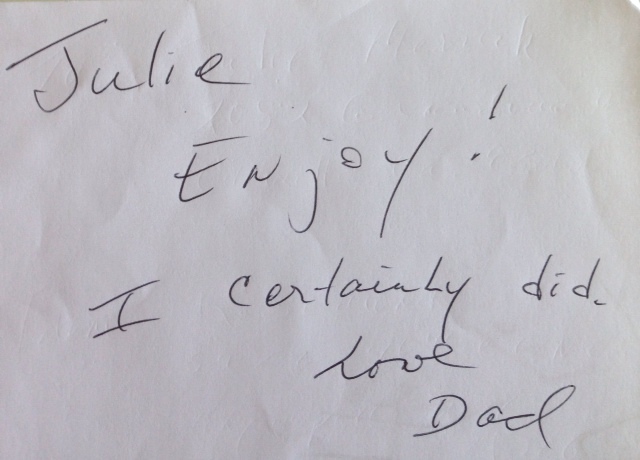 I can’t wait to share this post with my dad to see if he remembers sending this note to me! This photo is from a card that I had for over four years. The reason why I know it has been that long is because I put a return address on it was from a home we lived in four years ago. I’m sure it has many fingerprints on it from me as I’ve taken it out if its “Misc.” drawer dozens of times and always ended up putting it back, feeling as though it just wasn’t the right time or person to send it to. Yesterday, a friend texted me to see how I was doing after a procedure I had for my hip. (Just a shot to hopefully calm whatever is going on in there-blog for another time! Ha!) Other friends checked in on me too, but for some reason hers stood out and I thumbed back through some our text exchanges and immediately thought, “She makes my life richer!” I headed right over to the card to send to her and it is now somewhere between my mailbox and her home. She’s not my best friend, we haven’t even hung out a lot, but she’s funny, creative, witty, true and caring. She’s a wife, a mom, a daughter, business savvy and my friend. I hope she enjoys receiving this card as much as I did sending it! Reason for this post? Buy cards that you like and there will come a time when you’ll instantaneously know who deserves to get it in the mail.